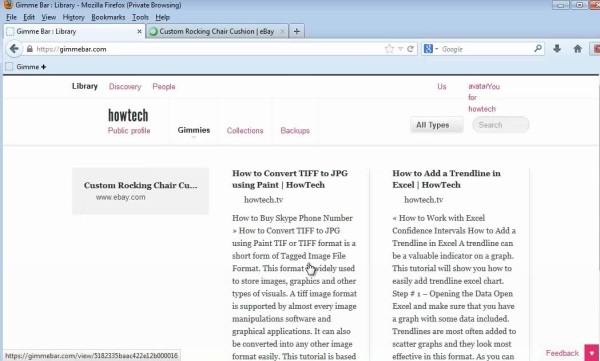 In this tutorial you will learn how to save a web page and share it with friends. There is, of course, more than one way of sharing a web page with your friends, and you probably tried many of them by now. Sending an email, pasting the link into instant messenger applications, writing it on stickies, walls, tattoos, etc. 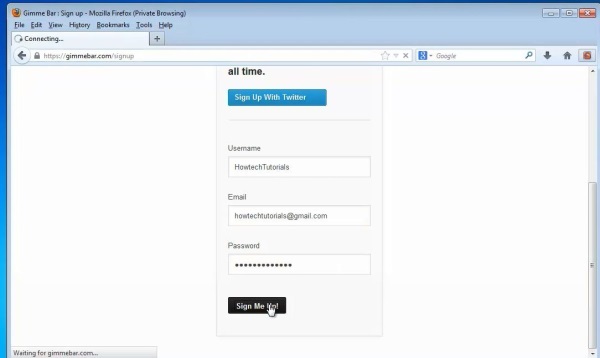 Today, we are going to show you an easy way of doing this inside your browser, without having to launch another application or to get up from your computer. Here it is. Step 1. 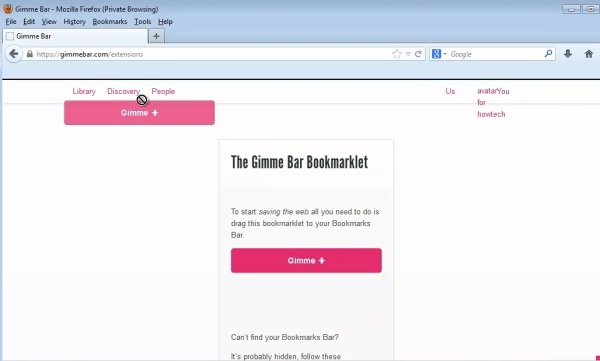 Open a browser window and go to gimmebar.com. Sign up with them by leaving them your email. Step 3. Now go to the page you want to save and share. Click the Gimme tab on your bookmarks bar. On the lower page of the screen, Gimme shows you your two ‘pockets’, the public and private ones. If you want to add this page to any of them, click the “Gimme page” and select public or private. Your stash is updated with your selection. Step 4. Once you finished ‘harvesting’, you can go to your Gimmebar account and manage your searches. Go to your library. As you see, your saved pages are all here under the name Gimmies. Select one of them. Step 6. At the end of the page, you are offered the option to share it with your friends. Choose the ones that are truly worthy of your savings.